generous to me. We shared sunflowers seeds and raisins, smiles and gestural conversations that felt relaxed and intimate." Duguid includes more than 125 recipes in Taste of Persia, which re- ceived a James Beard Foundation Award for Best Book of the Year 2017, International. Among her other award-winning cookbooks is Burma: Rivers of Flavor (Artisan, 2012) in which she takes readers on boat trips and into a temple in Rangoon. Then she discusses Buddhism's central role in Burmese life. Will I travel in Duguid's footsteps? Certainly not soon. But, like her, I relish a chance to expand my world through travel, food, and personal connections. So, maybe someday. 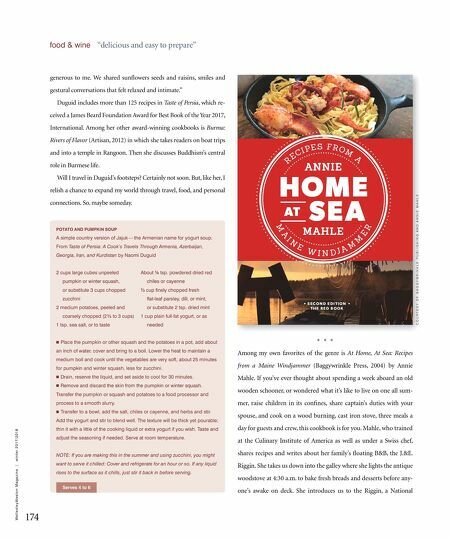 * * * Among my own favorites of the genre is At Home, At Sea: Recipes from a Maine Windjammer (Baggywrinkle Press, 2004) by Annie Mahle. If you've ever thought about spending a week aboard an old wooden schooner, or wondered what it's like to live on one all sum- mer, raise children in its confines, share captain's duties with your spouse, and cook on a wood burning, cast iron stove, three meals a day for guests and crew, this cookbook is for you. 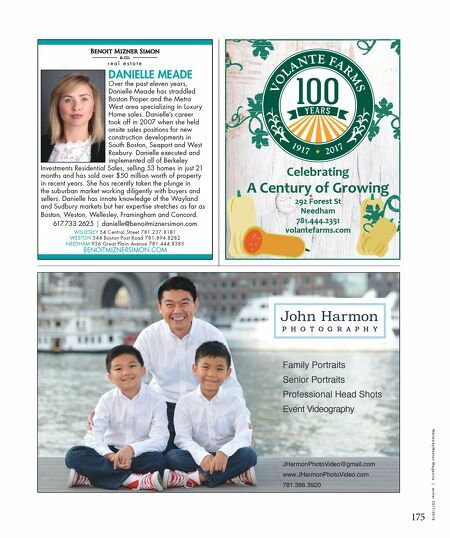 Mahle, who trained at the Culinary Institute of America as well as under a Swiss chef, shares recipes and writes about her family's floating B&B, the J.&E. Riggin. She takes us down into the galley where she lights the antique woodstove at 4:30 a.m. to bake fresh breads and desserts before any- one's awake on deck. She introduces us to the Riggin, a National POTATO AND PUMPKIN SOUP A simple country version of Jajuk — the Armenian name for yogurt soup. From Taste of Persia: A Cook's Travels Through Armenia, Azerbaijan, Georgia, Iran, and Kurdistan by Naomi Duguid 2 cups large cubes unpeeled pumpkin or winter squash, or substitute 3 cups chopped zucchini 2 medium potatoes, peeled and coarsely chopped (2 ½ to 3 cups) 1 tsp. sea salt, or to taste About ¼ tsp. powdered dried red chiles or cayenne ½ cup finely chopped fresh flat-leaf parsley, dill, or mint, or substitute 2 tsp. dried mint 1 cup plain full-fat yogurt, or as needed n Place the pumpkin or other squash and the potatoes in a pot, add about an inch of water, cover and bring to a boil. Lower the heat to maintain a medium boil and cook until the vegetables are very soft, about 25 minutes for pumpkin and winter squash, less for zucchini. n Drain, reserve the liquid, and set aside to cool for 30 minutes. n Remove and discard the skin from the pumpkin or winter squash. Transfer the pumpkin or squash and potatoes to a food processor and process to a smooth slurry. n Transfer to a bowl, add the salt, chiles or cayenne, and herbs and stir. Add the yogurt and stir to blend well. The texture will be thick yet pourable; thin it with a little of the cooking liquid or extra yogurt if you wish. Taste and adjust the seasoning if needed. Serve at room temperature. NOTE: If you are making this in the summer and using zucchini, you might want to serve it chilled: Cover and refrigerate for an hour or so. If any liquid rises to the surface as it chills, just stir it back in before serving. Serves 4 to 6 C O U R T E S Y O F B A G G Y W R I N K L E P U B L I S H I N G A N D A N N I E M A H L E 174 W e l l e s l e y W e s t o n M a g a z i n e | w i n t e r 2 0 1 7 / 2 0 1 8 food & wine "delicious and easy to prepare"